HOSTING 90 Review 2019: Is HOSTING 90 a Good Hosting? Hosting90 offers solid web hosting solutions that are good for simple static websites, but those looking to host multiple domains or large databases on a shared hosting plan may need to look elsewhere. The Czech-based Hosting90 has been offering website hosting solutions since 2002. They now serve customers in multiple countries across Europe, including Croatia and Russia. Their shared hosting solutions may be a good fit for personal and basic small business websites, but these are lacking in advanced features, and their database support is somewhat limited. Larger websites and some e-commerce websites will need to turn to their VPS hosting or dedicated server plans, or look elsewhere. What is reserved performance? Reserved performance means your service has dedicated resources that won’t be affected by the other domains on the shared server. This means that other high volume users will not impact the performance of your website. You’ll notice there’s not much listed for advanced developmental tools. That’s because there are none. Sure it supports PHP, but most web hosts do. But if you want to code using Python or other tools, you’re out of luck. If you’re a beginner, this host may not be for you unless you plan to use WordPress. They offer a CMS installer, but it’s limited to WordPress, Joomla!, and Drupal. They don’t offer a robust auto-installer such as Softaculous. Otherwise, you have unlimited FTP access to upload via the cPanel, so more experienced users will have few problems using this service. Hosting90 offers three shared hosting plans which vary drastically regarding storage. Below is a breakdown of each plan. The Lite plan is as basic as they come and not suitable for much more than the most basic websites due to storage, limited database capacity, and the lack of subdomains. That said, this plan is completely free — and you can even add your own pre-registered top-level domain to the account rather than being limited to a subdomain. This is an excellent option for those who wish to try out their service before committing to a paid plan. From there, their two other shared hosting plans ramp up your available storage significantly, but they are still limited on database capacity. The Hosting90 plan only allows 500MB total size between two databases while Hosting90 Plus only offers 1GB across ten databases. This means that websites requiring large databases will need to look for a different host. Note that the above limitations are for shared hosting services only. 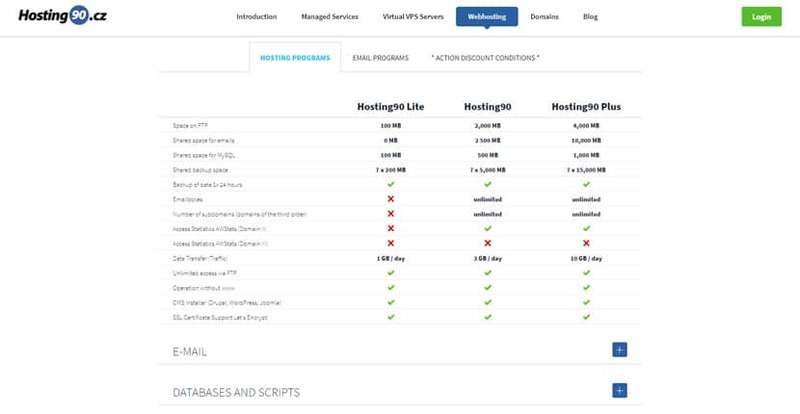 Hosting90 does offer a variety of VPS services that have far more features, including the ability to support large databases. Their VPS plans are definitely affordably priced — in fact, they may be one of the most inexpensive VPS hosts I’ve seen in the European market. These virtual servers come with an intuitive user interface that allow you to easily administrate your server; however, if you’re an absolute beginner to web hosting, this may not be the best option for you. Also note that this provider is a single domain host only. They don’t allow you to host additional domains on their shared hosting plans. However, they do offer free domains along with free SSL certificates, so smaller businesses and those requiring SSL security can save some money in that regard. Hosting90 offers average support consisting of phone support and ticketing support. Their live phone support is only available from 9 a.m. to 5 p.m. CET. They also offer a robust knowledge base, but make sure to have Google translate handy. Hosting90 is a useful host for basic websites and more complex projects requiring a VPS, but their shared hosting limits on features such as databases may be a dealbreaker and force a few e-commerce startups to look elsewhere. Also, if you need multi-domain hosting, this is not the shared hosting vendor for you. Other services offer better features and more flexibility than Hosting90. Wondering how HOSTING 90 stacks up against other Web Hosting companies? Enter any other Web Hosting company and we will give you a side-by-side comparison.